Police secure the Champs-Elysees, Dec. 15, 2018, in Paris. Protests against France's high cost of living — sapped by bad weather and recent concessions by French President Emmanuel Macron — were significantly smaller Saturday than at previous rallies. French protesters for the fifth straight weekend rallied against the high cost of living, although demonstrations were more subdued nationwide Saturday, partly because of concessions made by the President Emmanuel Macron earlier this week, as well as a combination of cold weather and rain. Several thousand people turned out in Paris. 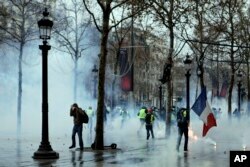 Scuffles erupted between protesters and police, who fired tear gas and used water cannons on demonstrators as they scurried down side streets near the famed Champs-Elysees boulevard. About 8,000 police and 14 armored vehicles were deployed to prevent a repeat of previous protests that turned violent, with protesters looting stores and setting up burning barricades in the streets. Demonstrators sit in front of a police water cannon on the Champs-Elysees, Dec. 15, 2018, in Paris. 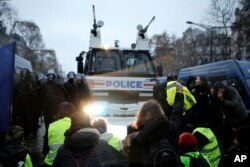 It was the fifth straight weekend of protests by the "yellow vest" movement against France's high cost of living. Police said more than 115 people had been taken into custody by Saturday afternoon. A week ago, French officials said more than 100,000 people had joined protests around the country. This week, police counted just over 33,000 protesters nationwide. In Paris, police had reopened the Champs-Elysees to traffic by early evening. The protests, triggered by fuel tax hikes, have morphed into a movement about France's high living costs, and has ballooned into the biggest crisis of Macron's presidency. The weeks of protests have exposed intense resentment among noncity residents who feel that Macron, a former investment banker, is out of touch with struggling middle-class and blue-collar workers. Macron has since abandoned the fuel tax hikes and hopes a package of tax and minimum-wage measures will help ease tensions in the country after the recent violent clashes. Protesters, however, have made new demands to address other economic issues hurting workers, retirees and students. Government officials are concerned that repeated outbreaks of violence will weaken the economy and raise doubts about the government's survival. Officials are also concerned about far-right, anarchist and anti-capitalist groups like Black Bloc that have mimicked the "yellow vest" movement. The "yellow vest" movement was named after the safety jackets French motorists are required to keep in their vehicles, which the protesters wear at demonstrations.